It’s a suite in the skies. There are a handful of details that can set apart a luxurious flight from a typical one. The seasoned traveler knows he can count on the welcoming staff, innovative amenities, and exceptional service that come with a top airline and a business class ticket. The suites provide privacy for those who desire it. While any seat on a Qatar Airways flight is perfectly comfortable, the newly introduced QSuites on selected flights provide a new type of intimacy. The new suites are a godsend, offering partitions between seats and enough room for you to do as you please. Additionally, it comes with seats you can fully recline. How much space exactly? These business class suites are adjusted to be expansive enough to fit a double bed. Also included is a cozy quilt, ambient lighting to set the mood, and substantial storage space. The adjustable panels in the suite allow you and your travel companions to socialize or eat together. If you’re a jet-setter who likes to travel with family and friends, the adjustable privacy panels of the Qsuite is made for you. The panels may be configured to create a private room that you may share with your children or friends in adjoining seats. You may combine individual spaces if you’re traveling with a companion, or opt for the suites in the center row if you’re a bigger group, which allow up to four passengers to create one large suite during the flight. In business class, the dining service and the quality of food are always top priority. Enjoy a menu crafted by Qatar Airways top chefs, ensuring that your in-flight meal is suited to your palate. Similarly, your airline will take your diet into consideration, and give you the chance to reserve the main course before you even check-in your luggage. The dine on-demand feature, exclusive to QSuite passengers, allows them to sate their appetite whenever they choose. Another benefit of the adjustable privacy panels is that it allows passengers to order a sharing platter for an enjoyable dining experience together. The crew members customize each travel experience. Whether you travel for work or leisure, you are ensured of a one-of-a-kind experience with the business suite access. The crew members make it their business to know the nature of your trip and have every possible amenity you need in store. When making your next booking, take a page from the jet-setter’s travel guide and book a suite from an airline that provides all these business class benefits. 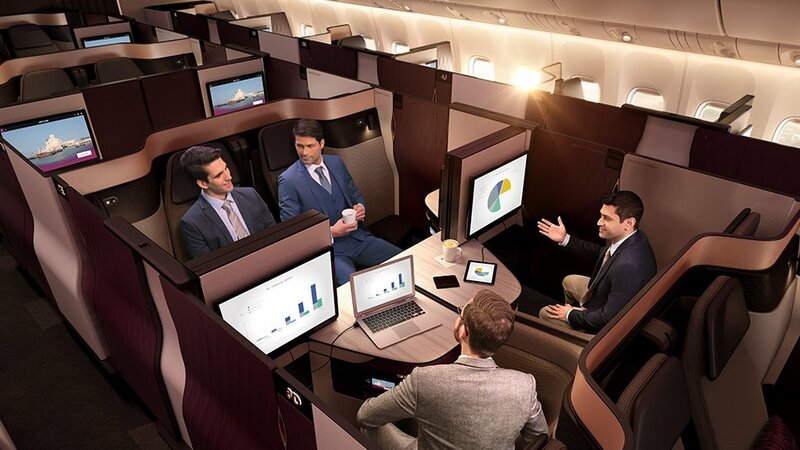 Recently, the Qsuite was unveiled on Qatar Airways’ Boeing 777 aircraft. The first of its kind, Qsuite offers travelers with a first-class experience in a business class suite, and is one of the first to offer double beds in this category. With all the luxuries listed above, the Qsuite creates a bespoke new experience for the business class passenger. Currently, the Qsuite is available on flights to London and Paris, and soon to be available on flights to New York. Visit qatarairways.com to book your next Qsuite experience. This article was created by Summit StoryLabs in partnership with Qatar Airways.